"How long can I keep doing this? Burning the old me, to make a new one?" My first EDH deck, now updated (I'll continue to update this list as better cards come into my possession, and changes are made). Basically the main idea is to establish and maintain board presence using tokens and graveyard recursion while putting pressure on the opponents. Lots of opportunity for lifegain and even some card advantage. We also have several win-cons in place from Felidar Sovereign to combining things like Treasure Map + Smothering Tithe + Pitiless Plunderer + Revel in Riches (Bolstered by Teysa Karlov ) or the Sanguine Bond + Exquisite Blood combo. Once you build up enough life, you can combo Exquisite Blood with Aetherflux Reservoir to blast everyone else's life totals, essentially free of charge. 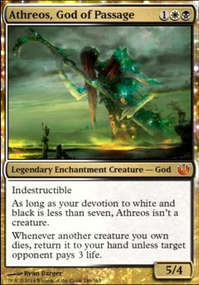 Sac outlets include Priest of Forgotten Gods , Ayli, Eternal Pilgrim , Teysa, Orzhov Scion , Spirit Bonds , Starlit Sanctum , and Westvale Abbey for added value from that graveyard recursion, plus Skullclamp eats your weaker creatures for more cards.